I love, love, love this vintage inspired cake topper by Etsy seller Carrie Klein. 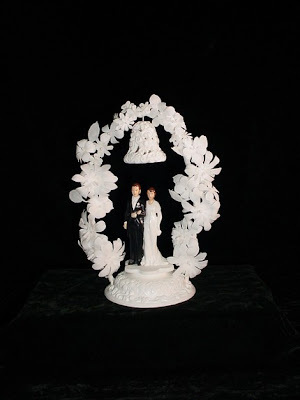 I'd probably ask for slightly less crafty flowers, but I adore the hand-cast base and bell, the sweet little bride and groom and the classic sensibility. Don't you wish your handmade skills had evolved beyond note cards and small knit goods to include things as beautiful as this?